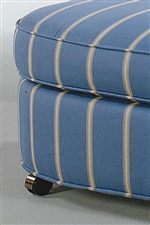 The Bridgeport Casual Ottoman with Casters by Braxton Culler at Design Interiors in the Tampa, St. Petersburg, Clearwater, Florida area. Product availability may vary. Contact us for the most current availability on this product. Padding & Ergonomics The Fiber Plus cushion is a hand-crafted cushion with an inner core of high resilience, high performance polyurethane foam, double over-wrapped with a four-ounce super soft fiber. The entire unit is sewn into a tightly woven down-proof casing which allows trapped air to be slowly released, thus providing you with a soft, easy settling effect with the look and feel of genuine down. 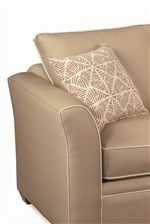 The cushion will continue to wrinkle and soften over time, creating the desired “casual lifestyle” look. The Bridgeport collection from Braxton Culler is a stylish and comfortable choice for outfitting your apartment or home, and offers pieces that are perfect for building a living room setting in smaller space constraints. The laid-back, understated style of these pieces is created by casual style features like flair tapered arms, tapered wood block legs, and welt cord trim. 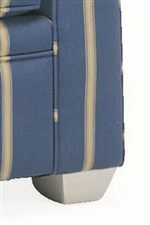 Featuring adjustable pieces tailored for the best usage of your space, this collection offers a chair and a half that converts into a sleeper, and a wheeled ottoman, so you can easily convert your room from a living room into an impromptu bedroom space. Other pieces included in this collection are a compact sectional and stationary sofa, so you can furnish your entire living room in your choice of upholstery colors. The Bridgeport collection is a great option if you are looking for Casual furniture in the Tampa, St. Petersburg, Clearwater, Florida area. Browse other items in the Bridgeport collection from Design Interiors in the Tampa, St. Petersburg, Clearwater, Florida area.